Residents and architects know the importance of visual privacy, but the psychological value of sound privacy is often forgotten in building design. In attached dwellings, sound transfers between adjacent structures. Hotel guests have experienced the lack of adequate sound privacy between room walls, and apartment building residents may have been subject to the sound of their upstairs neighbors' footsteps. Indeed, sound privacy is an attribute that helps makes detached ADUs preferable to attached units. In contrast, detached ADUs can be quiet urban retreats due to not sharing structural walls with another unit. My ADU has thick, insulated walls, which deaden the sound of the busy city that surrounds it. But, inside the exterior walls, sound travels freely. Why is Sound Privacy Relevant to ADUs? Good small house design attempts to make a place feel large despite the smaller size. This is accomplished by designing a relatively open floor plan. This means conjoining the living room, dining room and kitchen, into a "great room". Vertically, ceilings are lofted, and ideally, parts of the 2nd floor ceiling should also be visible directly from the ground level to create an illusion of grandeur. Clean indoor air quality design utilizes hard surfaces instead of rugs and carpets, which tend to trap atmospheric deposition and dust mites (and their excrement), collecting and exporting particulate matter into the ambient indoor air that we later breathe. Deliberately utilizing both of these design techniques, our ADU had both an open floor plan and hard surfaces (concrete and hardwood floors). Unfortunately, when coupled, the byproduct of these two design techniques was noise reverberation from one room to the others. Sound tended to reverberate off of the hard surfaces and it traveled easily from one open room of the house to another. Prior to building, I wasn't sure how the sound would behave in the ADU, but while living in the ADU over the last ten months, I have experienced it first hand. Noise transfer has actually caused me to loose sleep this year- no laughing matter for a lover of sleep. For example, if my partner woke up and quietly made coffee while I was sleeping, it was audible enough that it woke me up. If I watched a movie downstairs at night, it was very easy for my partner to hear it from the bedroom. When my dog was lying in the living room scratching behind her ears, it jingled her metal name tag and it was like she was shaking a tambourine. In the design phase, we'd considered the possible audio impacts of the vertically open floor plan, but thought that it would be wise to actually live in the ADU before making a decision about whether, and how, to enclose the bedroom walls to prevent the transfer of sound from the downstairs to the bedroom. My partner and I loved the look of the opening to the bedroom, but it wasn't worth continuing to lose sleep over it. Our design goal was to develop an artistic sound barrier that would still let light pass through the house, but that would cut down the amount of reverberating noise into the 2nd floor bedroom. I worked with a Portland craftsman and friend, Eric Bohne, to develop, design, and execute a functional design to visually fit alongside the stunning metal handrail and the alternating tread staircase to the attic. After many iterations of design ideas (which I won't bother to describe, but you're welcome to see in the photo and video collection below), we settled upon a design that would accomplish the desired goals. 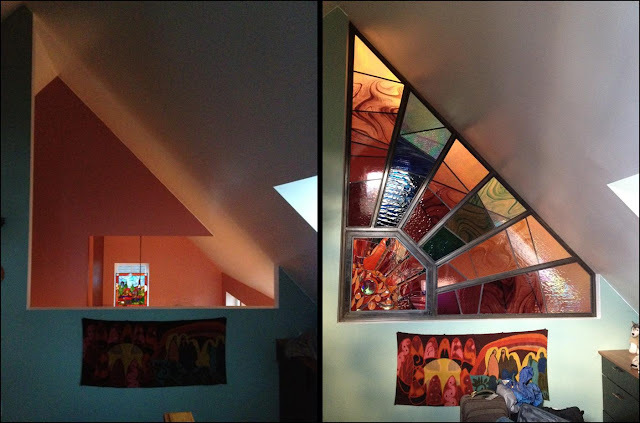 We decided to use stained glass as the medium, structurally connect the pieces with a steel frame. This captioned photo and video collection shows the chronological steps of the design, building, and installation process. There are ~65 pictures and ~5 videos in this collection. A beveled gem, enshrouded by a colorful burst of clear bevels and richly toned stained glass, composes the focal center of the metal and stained glass sunburst sound barrier. Here are images of the artistic sight lines created by the finished sound barrier in varying lighting conditions. To accomplish this design, Eric built a precisely-measured frame from steel tubing. I hired a talented glass worker, David Schlicker to do the complex stained glass elements. Together, Eric and David created a piece that accomplished the design goals- it deadened the sound transfer but still artfully allowed light through, creating an artistic piece that augmented the space, rather than detracting from it. Before and after images of the sound barrier. These images are taken from the kitchen below. Before and after images of the sound barrier. These images are taken from the bedroom side. 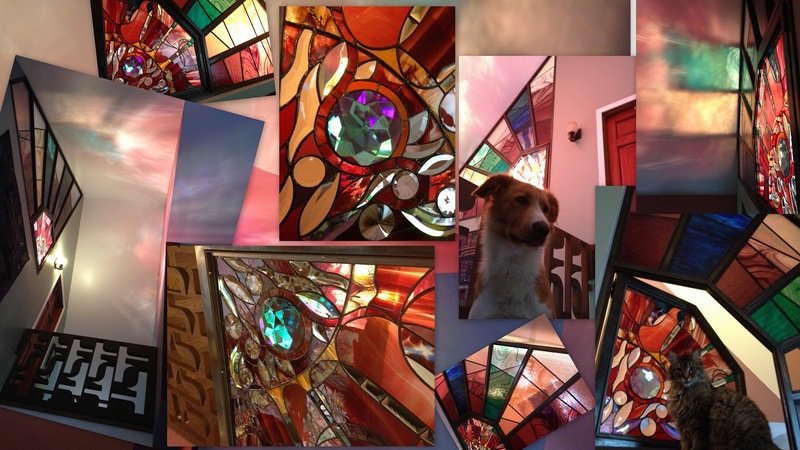 This five-minute video shows the stained glass piece in completed form, and details the architectural and design aspects of the stained glass and the layered construction method that was used to minimize sound transfer. In this five-minute video, David goes into detail about the types of glass used in the stained glass piece. He explains each element of the production of the window centerpiece. The whole project took two months to build. The metal frame took about a week and the glass took about six weeks. Both the metal and the glass were built off-site in the respective studios. Installation went flawlessly, and only took a few hours. While on the topic of artistic sound barriers, I recently built a hatch door for the attic. This gives both visual and sound privacy for guests who sleep there occasionally. Here is a two-minute video that shows what the hatch door looks like and how it works. It's built from a salvaged wooden door that match the other doors in the ADU. Disturbance eliminating headsets are the latest trend in the digital industry. When you have the best headsets, the advantages you get over-shadow the cost you compensated for it. Because of the numerous advantages you get from headsets, many are going insane about them.